Looking to saddle up an ATV and hit the trails to see the sights and hear the sounds of beautiful Vallecito Lake? You’ve come to the right place! Altitude ATV & Side-by-Side Rentals offers a full line of ATV rentals in Durango, CO, as well as UTV and side-by-side options as well. We’ll make sure your time spent traversing the trails is comfortable, enjoyable and exciting! These units are suitable for all trails, which includes roads and trails that are 50” or smaller in width. These units are suited for main roads, defined as roads that are more than 50″ in width. These units are suited for main roads, defined as roads that are more than 50” in width. Choose the rental that’s right for you, the time that you want to spend exploring the alluring nearby scenery and get started on your very own adventure today! 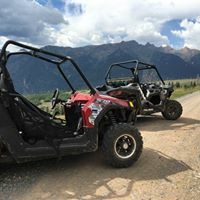 To get the most out of your ATV rental in Durango, CO, we’re pleased to provide you with a wide range of trails and courses that you can follow, based on what you’re looking to see. We’re delighted to offer stunning sights around Middle Mountain, including the Wiminuche Wilderness area and other gorgeous natural formations around La Plata County, CO. Whether you’re a hunter, fisherman, hiker, camper or just a lover of the great outdoors, we’re here to provide you with guidance regarding the surrounding areas, so you’re able to make the most of your trip. If you’re interested in exploring the local Vallecito Lake and Middle Mountain areas atop an ATV or you’d like to learn more about our rental rates and terms, please contact us today by calling 970-403-2260.